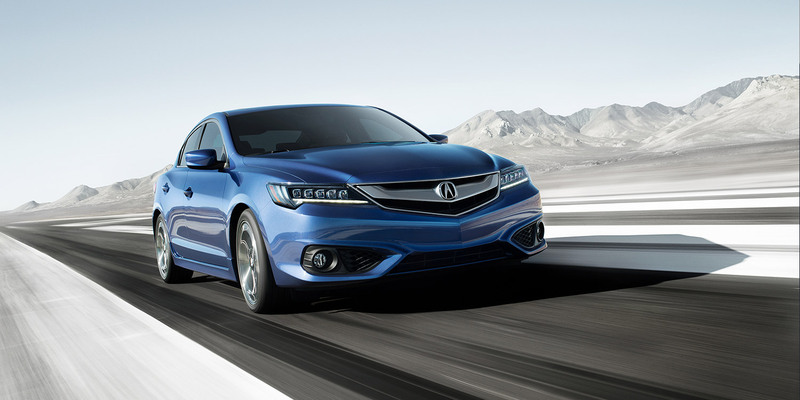 Acura rolls out its 2016 ILX a bit early to update its look and shore up its underpinnings a mite too. The entry-level Acura that runs on a Civic platform was nice before its remake, but a bit sloppy in turns. Still, for the price, it was a fine step up toward luxury compared with other compact sedans. Think Chevy Cruze for a size comparison. The 2016 features a restyled grille and LED rear lights, but you’ll mainly notice its fancier headlights, what Acura calls Jewel Eye LED lights. These group five square LEDs that look a bit like my mom’s old engagement ring into each lens. That spiffs up the nose so you can tell the new model from its predecessors. But more important in the long run is a stiffened chassis, better shocks and springs, thicker anti-roll bar in back and firmer suspension bushings all aimed at firming the car’s feel and ride. Mission accomplished. In fact, some might find the ride a tad too stiff and choppy over really rough city streets. But the improvement is most noticeable in the handling which feels more responsive and virtually eliminates body roll in tight high-speed maneuvers. Steering feel is still light and there’s some play left in the wheel, but overall the feel is sportier. Power remains a selling point too if you want your family sedan to scoot. The 2.4-liter I4 engine that Honda has used in its Civic SI delivers a strong 201 horsepower with 180 ft.-lbs. of torque. Not a rocket sled, but quick out of the gate, even with the fairly smooth 8-speed dual-clutch automatic in the tested ILX Acura WatchPlus trim test car. That’s a level up from the base ILX that lists at $27,900. The metallic gray test car started at $29,200 and with only a $900 delivery fee clocked in at $30,100. The WatchPlus edition mainly upgrades all the technical goodies that are becoming gauche on today’s cars. ILX features an attractive well laid out dash. The partial list includes adaptive cruise control, a collision mitigation system, lane keeping assist (LKAS), road departure mitigation, forward collision warning and color multi-info display. For the uninitiated, those features mostly use sensors to keep you from running into something or to stay within your lane on the highway. The road departure and lane keeping read the painted lines on the road sides and actually tweak the steering wheel to keep the car in its lane. Other sensors sound off whenever they fear impending doom and adaptive cruise control slows the car whenever a slower car pulls in front of you. That happens a lot. All those goodies may be worth a couple grand, but going up to the Premium Package at $29,900 will land you much more useful electronics, such as a blind-spot warning system, rear cross-traffic monitor and an 8-inch display screen, up from the smallish 5-incher that’s standard. The Premium model also has HD radio, Sirius satellite radio an extra speaker, so 7, and a subwoofer and navigation app. There was no navigation system in the test car. A dark interior to be sure. Naturally you can load the ILX up with more performance and electronics extras to raise the starting price to $34,890. But at that, you may want to consider moving up to Acura’s TLX sedan. Ultimately what you get with ILX is a comfortable and quiet four-passenger sedan with leather interior and good power and handling. Inside, the ILX cockpit is highly functional. It features a clean dash that’s easy to see and use. Buttons and controls are logically placed. The dark gray test car was equally dark inside with black leatherette seats. I believe that’s leather’s second cousin. It looks fine and the seats are fairly comfortable, but the bottom cushion is mostly flat. There’s more contour to the seats’ backs, but the driver’s seat offers no adjustable lumber support, manual or power. Dash trim is a matte silver, but some other lighter materials inside would have helped lighten the dark cockpit. Even the center stack is textured brushed black trim. At least the headliner was gray to break up the monochromatic bat cave look. Things I like include two-level heated front seats, a big glove box, and get this, real radio channel selection buttons, six of them, so tuning the radio is easy. But the screen is small, so put on your bifocals. Overhead there’s a sunroof plus sun visors that slide. Driver’s view of the main gauges. Equally there are some down sides. For instance, in the test car the back seat is not split and does not fold down, so you’re limited to the 12.3 cubic feet of space in the trunk, a bit smallish. I’m also quite tired of all the high window sills on car doors these days. They add to a cramped feeling in the car, limit visibility and don’t allow a shorter driver to rest his or her elbow on the window ledge when windows are down in summer. Another visibility issue that seems to be more and more common in cars is the giant thick A-pillars along with large outside mirrors that block side visibility, making safe viewing at 4-way stops particularly tough. Gas mileage though is quite good in the ILX, a real bonus for a car with 201 horsepower. I got 28.4 mpg in about 60% city driving. The EPA rates the car at 25 mpg city and 36 highway. However, it does prefer to drink premium. 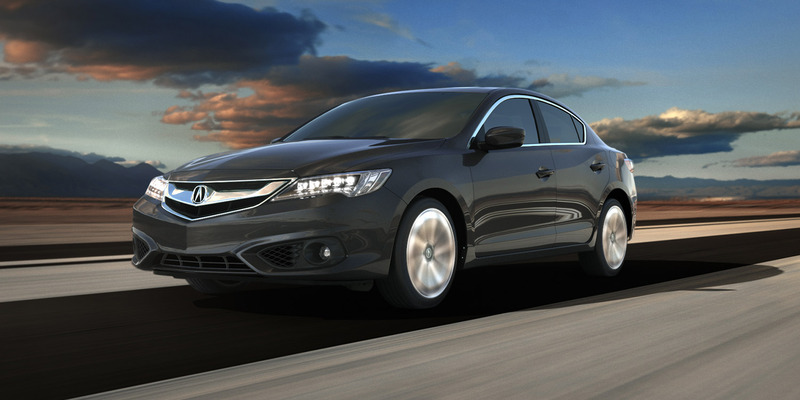 ILX is a sporty compact for a low entry-level price, good power and good gas economy. The new nose gives it a more interesting appearance too. 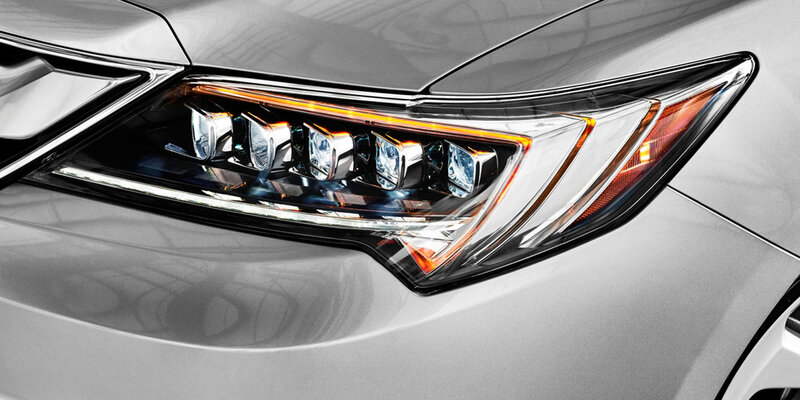 The Jewel Eye LED headlights do look a bit like a diamond ring. Hits: Good power and decent handling along with a quiet interior. Clean dash controls, real radio channel buttons, a sunroof, heated seats, visors that slide and a big glove box. WatchPlus comes with many tech items and gas mileage is good too. Misses: Choppy ride, back seat isn’t split and doesn’t fold down, small radio screen, high door window sill, big front/side blind spot due to large A pillar/mirror combo.